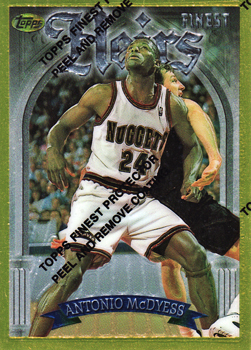 I make no excuses for the fact, that my recent posts have been dominated by cards that were released in the 1990s. As I have returned to the hobby, I have concentrated on trying to complete the chases that I started but never fully completed. 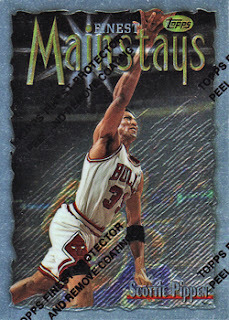 One set I did though complete back in the day was of the 1996-97 Finest base set. 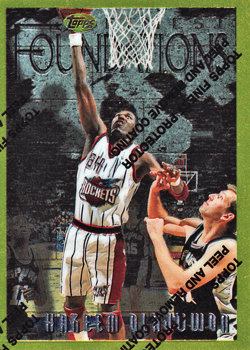 This 291 card set, was released in two series and divided into three seperate tiers; the 'common' bronze, 'uncommon' silver and the 'rare' gold tiers. In the early days of the internet, putting together the whole set (which had a high book value of $1,300 at the time of its release) was pretty tough ask and a took good deal of work finding all of the cards. Consequently, I was pretty pleased with the achievement when I completed the set within two years of its initial release. In early 2002, I made the decision to sell the complete set (along with a number of other cards) to help fund a round the world trip. I actually was out of the country for just shy of two years and had an amazing once-in-a-lifetime experience, travelling through Central & South America, Australasia and Asia before returning to the rat race in 2004. So I can not say that I regretted the sale, or that the funds I received from it, were not put to good use. But not owning the set grated. So much so, that a few years ago I decided to repeat the exercise! In my mind there is little fun in going and buying a complete set. I like to do things the old fashioned way. So I bought two boxes (one from each of each series) and busted away! This took me quite close to completing the bronze common set and I have since been steadily adding the missing silver and gold cards ever since. The delivery that I took from checkoutmycards.com yesterday, has brought me with 15 cards of finnishing the chase for a second time. 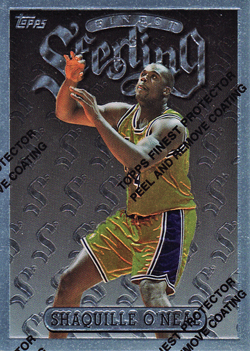 The standout cards (then as now) are the Kobe Bryant bronze RC #74 and gold #269 card, quickly followed by the Michael Jordan gold #291. 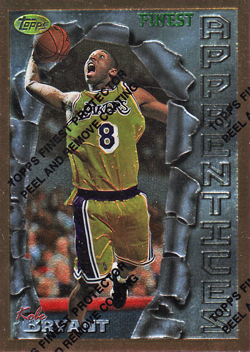 With the the resurgence interest in his 1990s insert cards, the Kobe gold cards in particular has jumped in price of late and currently has a High BV of $150 - compared to $60 back in 1997. It is in the gold cards of other players where the set has seen a price reduction. 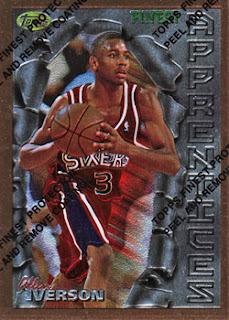 Whilst the gold cards of Grant Hill, Allen Iverson and Kevin Garnett once had a High BV of $60, they are now only listed with a value of $12, $20 and $25 respectively. I should be able to complete the set relatively easily over the course of the coming weeks. I then need to decide if I want to take on the slightly harder (and significantly more expensive) task of chasing the refractor parallel set. Finally, as you can see from the images below, I am very much in the 'do not peel' camp. Always have, always will be. An 'Exquisite Final' for King James?